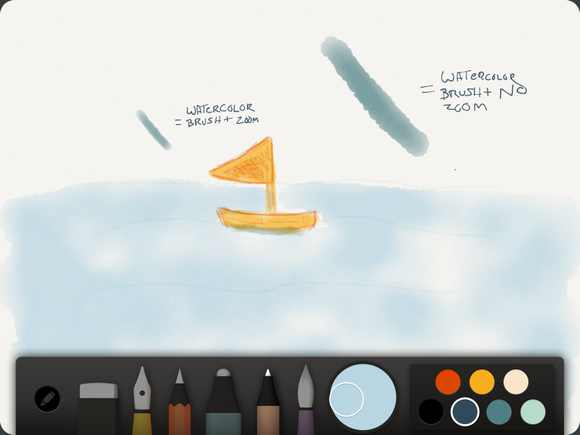 I’m a big fan of FiftyThree’s Paper app for free-form sketching, drawing, and even note-taking. You can do quite a lot with this relatively simplistic drawing program, and I’ve been using it as my primary doodle pad for quite some time. For those who have never experienced Paper, here’s the deal: The iPad app is a series of moleskine-esque digital notebooks (in landscape orientation) where you can use remarkably real simulations of brushes and pens to sketch, ink, marker, or watercolor. Each brush costs $2, though you can buy the Essentials pack for $7. For me, it’s a go-to app on my iPad mini, and I recommend it to pretty much everyone. 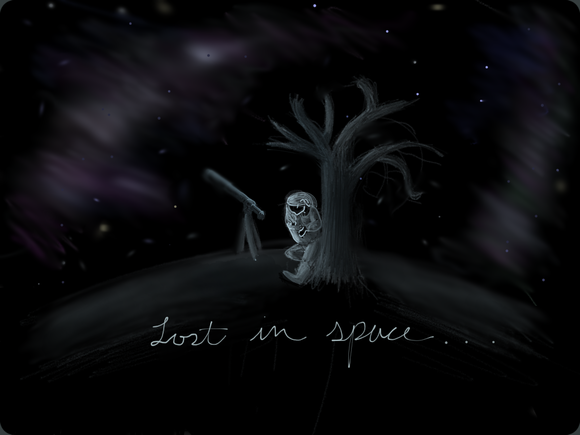 One of many sketches and doodles I've made with Paper over the years. But even your favorite apps have annoying quirks and omissions you wish they would fix, and Paper is no different. I’ve been frustrated for a long time with the app’s mechanics for using speed to simulate pressure—while it works very well in certain brushes, I’ve always had problems getting the Color tool (watercolor brush) to fill in lightly without having to speed across the paper. Most of the brushes also have set sizes that you can’t alter, which made the Color tool particularly difficult to work with when drawing on a small scale. I had a few tricks to get around these limitations—repeated layers of extremely light tone with the Color brush, for example—but I’d been holding out hope that FiftyThree would find options for Paper’s brush-sizing dilemma that didn’t require it to add extra switches or controls. The Zoom tool gets some new use in this update. Version 1.6.1, which came out Wednesday, gives Paper a slight redesign for iOS 7 and attempts to address several of these issues; while it’s not always successful, the update is a great improvement. Paper’s design tweaks consist mostly of small adjustments across the board: flatter menus, smoother-looking tools, and the like; its skeuomorphic digital journals and cartoony brushes remain as charming as ever. The two other big changes in 1.6.1 are both sized-based: automatic brush size adjustments for the Eraser, Color, and Blend tools when working with the Zoom loupe open, and variable dot sizing for the Draw and Eraser tools. Adding a second brush size when using the Zoom tool is by no means a panacea for my sizing issues, but it’s a great help. When you pinch to use the Zoom tool and then use the Color brush, the resulting watercolor line is just one-third of its non-zoom thickness, making the brush a lot more usable for small objects. 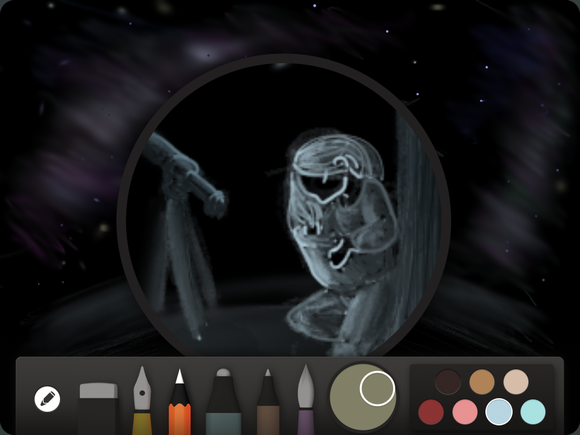 Inside the Zoom tool, the Color tool makes a line one-third its normal size. My one quibble is that the Zoom tool can only cover so much of the canvas; for most brushes, this isn’t an issue, but the Color tool needs to be applied in one continuous brush stroke unless you want your watercolors looking blotchy. If you can’t see the entirety of, say, a face in the Zoom tool, you can’t really use the Color tool in the loupe without some awkward tweaks. But that specific issue aside, the implementation is a great compromise for those of us clamoring for more brush sizes. 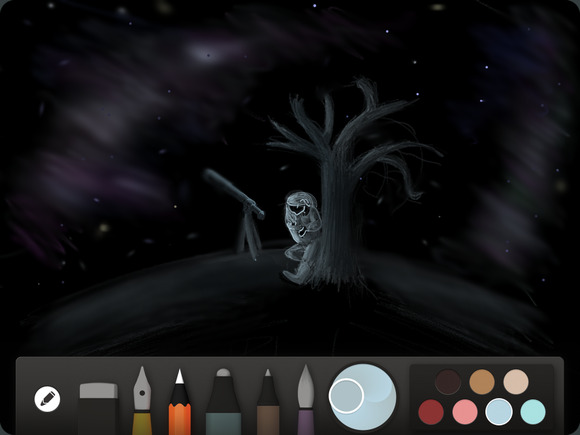 The other size-based tweak is the introduction of dot sizes to the Draw and Eraser tools. 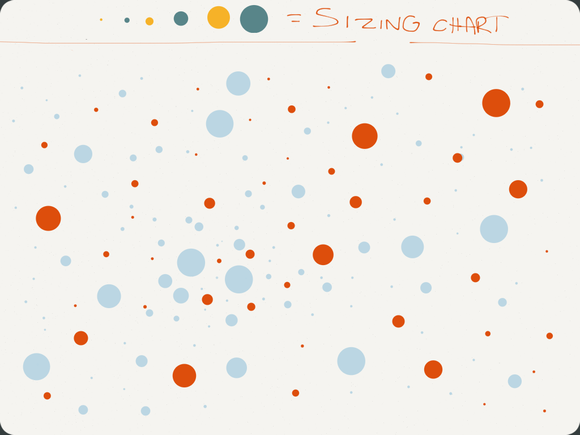 By pressing down on the canvas with either tool, you can now make up to six different sizes of dots; an immediate press will get you the smallest of dots, and adding (roughly) a quarter of a second will get you each subsequent size. It’s sometimes a tad difficult to create the size you want on your first try, but that’s where Paper’s Rewind tool (the app’s version of undo) comes in handy. Experimental art with Paper's dots. As a whole, Paper continues its reign as one of the best programs out there for natural-looking digital journals. FiftyThree’s steadfast commitment to emulating real-world tools and its reticence to throw menus everywhere may frustrate me on occasion, but its resulting innovations are often much better than the digital features we’re used to. (Rewind is a great example: At first, I missed the undo button; now it’s a tool I wish was in all my drawing programs.) The company has taken the slow and steady route of improving and adding features to its app, and I appreciate the care and finesse that’s gone into the end product. Though Paper deliberately eschews the bells and whistles of veteran drawing apps, it's still the best program for naturalistic sketching and drawing. The Rewind tool is excellent for undoing mistakes.